​The expedition involved a 3,000km paramotor flight from Ireland to Africa, and was a fund raising and awareness campaign in aid of Gorta - Self Help Africa , the International Aid Agency. This trip was inspired by the remarkable fundraising events run over the past few years by a couple of friends, David Burns and Magnus Collins. David and Maghnus were swimming the entire Coast of Ireland last summer, when Oisin spent a little time supporting them off the West Coast. Their enthusiasm and commitment was the motivation to get up and do something within my own field of sporting interest, and support their efforts. David Burns works in Dublin with Gorta - Self Help Africa, and is obviously very close to the work of the organisation. Their recent expeditions and adventures have been fund raising events for Gorta, among others. Maghnus and David's Adventures: Learn more. Apart from the devastating plight of the refugees crossing the shorter crossings of the Eastern Mediterranean from war torn Syria and further afield, the vast movement of migrants travelling from Sub- Saharan Africa through Libya, Tunisia and Morocco and heading for the Mediterranean and a perilous crossing to Europe, is a humanitarian disaster unparalleled in recent years. Ireland has historically had a strong relationship with Africa and with supporting the work of the Gorta and other Irish Aid Agencies working throughout the African continent for many years. 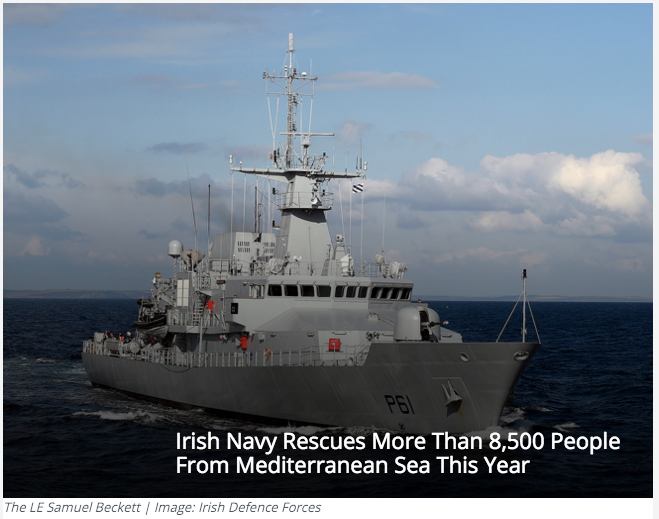 The Irish Navy, travelled from Cork last year to the Mediterranean to assist in the multinational humanitarian efforts off the North African Coast throughout last year and assisted in the rescue of more than 8,500 people from the Mediterranean Sea last year. Three Irish ships were sent to help rescue efforts in the region in 2015 - with the last, the L.E. Samual Beckett, arriving home just before Christmas. Looking on from a distance, the situation has become so desperate that one wonders what practical support we can give and how we can do to assist with the unprecedented flood of migrants. I firmly believe that the one of the most practical things that the citizens of Europe can do is to give more support to the Aid agencies working on the ground with local staff and communities, to help develop a sustainable way of living, and help end hunger and poverty in rural Africa. Gorta-Self Help Africa is a leading international development charity with an expertise in small-scale farming and growing family-farm businesses. They are motivated by injustice, by their expertise in small-scale agriculture and family-farm business, and the opportunity they have to help small farmers change the lives of their families. Malnutrition: One in 3 people living in sub-Saharan Africa are undernourished. Growing inequality: The world’s 5 most unequal countries are all in sub-Saharan Africa. Gender Equality: Women produce up to 70% of the food grown on small farms in Africa. Extreme Poverty: 414 million people across sub-Saharan Africa live on less than $1.25-a-day.